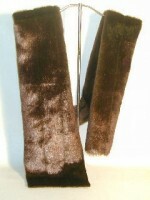 Tip-Dyed Mink Scarf is 7" wide and 72" in length. Kit comes with complete instructions for finishing, including instructions for lining if desired. Also included is fancy braid for covering seams if not using a lining.